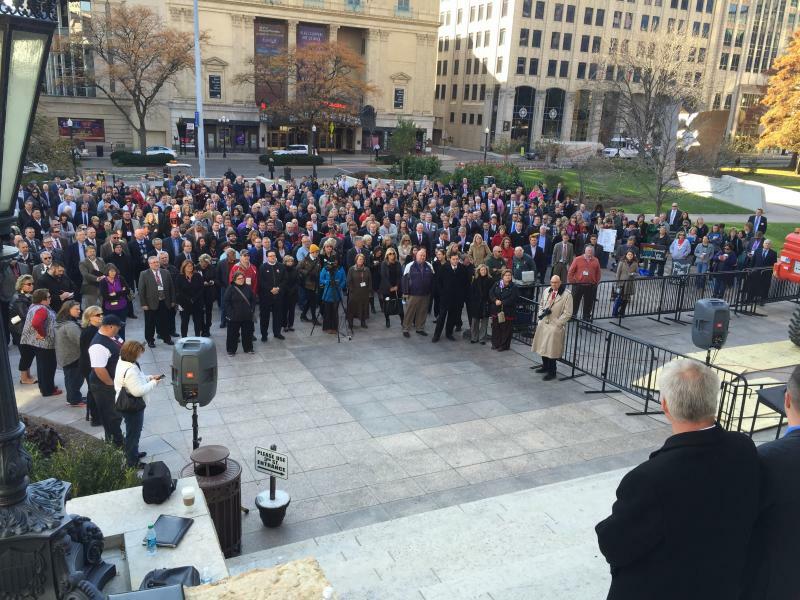 School administrators and education leaders gather outside of the Ohio Statehouse in Columbus. John Haswell is worried about his daughter who’s a sophomore at Shadyside High School in eastern Ohio. 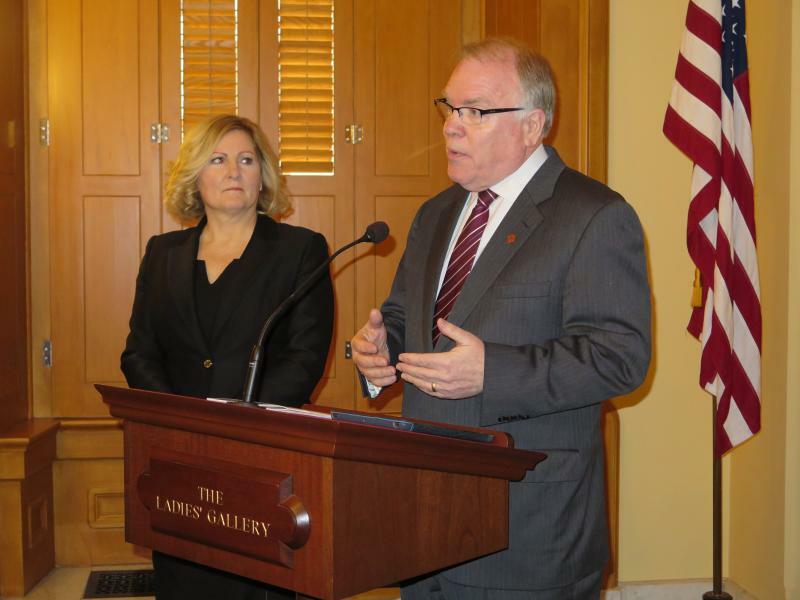 Haswell’s daughter and every other high schooler in Ohio all have new standards to meet in order to graduate in 2018 and every year after that. Instead of the old standardized test known as the Ohio Graduation Test, students must accumulate a certain score among 7 different tests. Each test gets a student up to 5 points. To graduate a student needs 18 points, but must also reach a minimum amount of points in each subject. Haswell’s not just a father, but he’s also the superintendent of Shadyside Local Schools. He says his daughter is not alone in struggling to stay above water. Haswell and hundreds of other school administrators gathered outside the Statehouse to protest these standards and voice their concern about the possible graduation crisis. The Ohio Education Association, the state’s largest teachers union, joined in on the rally. That group’s vice president, Scott DiMauro, says education leaders need to step in and fix what he calls a problematic policy. “We’re confronting the reality that we’ve got a whole lot of students through no fault of their own who are at risk of not graduating next year because of a policy decision that wasn’t very well thought through,” said DiMauro. Two blocks from that rally, the State Board of Education was getting a glimpse of just how dire the situation might be for Ohio’s high school students. A report looking at the class of 2018 showed that only 65% are on track to meet the standards needed to graduate. That means more than a third of current high school juniors need some type of remediation in order to graduate on time. As DiMauro explains, that creates a whole other stress on students. “The other problem that you have is that because these tests are tied to specific courses you’ve got a whole lot of students that are passing those courses, moving on to other subjects but then they have to retake tests in classes they’re no longer taking,” DiMauro said. Board of Education Member Stephanie Dodd says she and her fellow board members understand the urgency of the issue. Dodd believes there’s enough support from the board to change the standards and bring that required accumulated score down from 18, but says it needs to be a thoughtful change. “If we were to lower those points from 18 to a different number what would that look like in terms of graduation and how would that impact our districts,” said Dodd. There are two other paths to graduation aside from these 7 tests. One is to earn credits with career-field experience and the other is to score well on either the SAT or ACT test.